A paranormal friend of mine contacted me about my interviews with people who have encountered unexplained lost time or abduction experiences . My friend Ed Fleming told me he knew a man who he felt had been dealing with abduction events for many years. I asked Ed to find out if the man would allow me to talk to him concerning his abductions. Ed informed that the man has endured extreme events of high strangeness since he was a small child. He did not enjoy talking about them due to the reaction of most people including those who investigate or write about them. Luckily for me Ed was able to convince this man to spend some time talking to me. Brian is the name he used when I was introduced to him. Brian is a tall , handsome man in his early 40's. He is well spoken and friendly. He lives in a small town in the Pacific North West of the United States with his wife and children. He does not often talk about the events of his life but was willing to tell me part of what he has endured over the last 40 years. Brain's ordeal began when he was a child of four years of age He was living with his family in a small sleepy New England town at the time.. He recalls waking up in the middle of the night screaming and frozen in this bed unable to get up to run to his family for help. He recalls the terror of this so strongly it has stayed with him his entire life. Brian recalls that his father admitted he could hear his son screaming for help on occasion yet found he was not able to move from where he was in order to help him. His father would become paralyzed during these encounters unable to move his arms or legs . He would not be able to get out of his bed. When he could finally rise he would run in to the room where his children were sleeping only to find them asleep. These encounters remained a family mystery as they never did understand what was happening to them during those strange night time events. Brain's life continued on as a typical little boy on all other levels beyond the strange events at night until he was in his 8th year. Brain has a clear memory of an incident that happened to him when he was 8 years old. He was alone in his room playing when a very tall ( at least 7ft ) being entered his room. The being was more of a shadow as Brain cannot recall it having any clear features other than wearing a robe type garment. The being had light behind and around it. Brian will never forget the crippling fear he felt as this being came towards him while he sat playing in his room. He recalls the fear was so overpowering he was not able to yell or move. He only remembers up to this point and has no memory at all of how the encounter ended. The fear he felt during this encounter was so horrific that Brain can still feel it to this day. He told me he thought his heart was going to pound out of his chest he was so terrified at the being standing before him. He does not recall anything other from that point on. Brain lived his childhood and teens in constant fear of ongoing strange encounters . He often experienced the feel of a rush of wind pass over him leaving the sound of being in a wind tunnel in his ears. During this stage of his life he would also suffer from a pounding vibration in the front of his head . During these experiences he can recall being touched by hands on his wrists, and eyes. He could recall the sensation of floating during these episodes and being trapped in a dimly lit environment. Brain would feel extreme fear after one of these events occurred which would last with him for a very long time. Life was not secure or happy for Brain as a child. Brain grew up and went about his life as normally as he could despite the strangeness of his child hood. He joined the military and went about the business of being a soldier . His life seemed to remain on the road of normal as he went about the work of his military service. He was discharged after his enlistment ended and returned to the ranks of civilian life. His adjustment out of the service was not a smooth one as Brain did not have a set plan , a family or a home to return to at this point in his life.. Like many veterans Brian was discharged with a thank you and little more. He was dumped back into society without a place to restart his new non -military life. Brian found he was a bit lost and not sure which road to follow at this point in time. Within a short time he found his resources exhausted . Without choice he found himself living for a short in a homeless shelter somewhere in the mid west of the United States. Brain was trying to sort out his life and looking to find a place he felt he fit to begin the next chapter of his lifetime . He would search for work during the day and sleep and eat at the shelter at night. One night after returning to the shelter Brain went to sit on his bunk to read before going to sleep. That is all he remembers. The other people at the shelter claim that Brian suddenly stood up with a blank expression on his face and marched out of the building. A few people tried to call to him as he was acting so strangely however Brain simply marched off and out in to the night. Two days later Brain woke to find he was sitting on the town Library steps. He was just sitting there. He came around confused and feeling sick as if he had the flu. At first he had no idea where he was. He was disoriented, ill and worst of all wearing someone else's clothes. He had no idea where he had been or what had happened to him since he left the shelter two days prior or how he ended up wearing someone else's clothes right down to the shoes! Brian returned to the shelter to be told how oddly he marched out two days before but could not find anyone who knew where he went or who he had been with. Brian began to panic as he was afraid he was having a breakdown of some kind and went to a nearby hospital for help. He told them what had occurred and they admitted him for observation. They helped him with his flu like symptoms however found nothing else wrong with him and released him. They told him his ordeal may have been due to stress. Brain knew differently but had no idea where to go for help . Brain simply pulled himself back into life and hoped against hope that nothing like this lost time event would happen to him again. Brains life continued. He found his way to a normal life with a wife and kids . He was now in his late 20's and living for a time free of strange incidents. His problems started to reappear during his late 20's. One night Brain was watching TV on his couch while his wife was at work. Brain was home with his children who were in bed at the time. Brian recalls a sensation of being grabbed so hard that his instant reaction was to kick out at what he felt touch him. He can recall feeling that he hit something when he struck out but nothing was there. That is all he remembers. The next thing he knew it was much later in the night .He found he was still on the couch but dazed and confused. Quickly he regained his senses and jumped up and ran into the bedrooms where his children were sleeping. They were asleep and seemed to be fine . Brain was terrified as he knew something had touched him and that he had a struggle with whatever it was . The experience left Brain shaken and convinced he was in trouble. Shortly after this event occurred Brain was home with wife and kids when Brain decided to take a shower before going to bed. His wife was in the bedroom when Brian entered after his shower to get ready for bed. His wife took one look at him and started to yell at him in a rage . Brian had no idea what had set her off as she blew up at him and started to accuse him of cheating on her. She pointed at his private parts and demanded to know how he became so black and blue and bruised? Brain looked in the mirror to discover he was indeed covered in bruises and realized he had been sore and uncomfortable in that area for a few days. He thought little of it until he viewed the extent of the black and blues. His wife would not believe Brains story of fighting off an invisible force on the couch or waking later in the night confused and accused poor Brain of having cheating ways. This event ended in a split with his wife and a feeling of total helplessness to his situation. Brains life has continued on with both good times and bad. Brain was able to remarry and now has a strong family . The strange events continued on during his life until Brain had a vasectomy. As odd as all the events have been in his life the fact is that the experiences stopped after that surgery occurred. Brain recalls small amounts of things he cannot string together past fragments of memories of things he does not understand. He recalls seeing either Gray's or people or beings in suits made to look like the typical Gray aliens. He recalls being touched and trying to remove himself from where he was being held. He has constant flashes of these things but cannot connect them into a full fluid memory. Brian does not want to remember these things. His only goal on this level would be to remove what he can remember from his memory bank and to be left alone. Brian like many abductee's would never subject himself to being hypnotized. 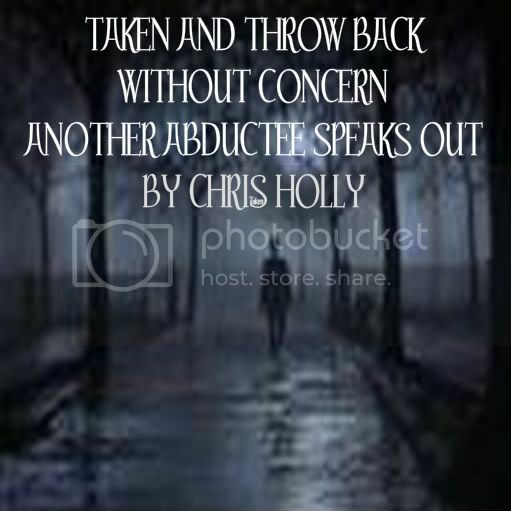 He agrees with most abductee victims that these things should be left alone and never handed over to those who have no knowledge or understanding of what they are dealing with. He recalls seeing other children during his confusing experiences. He also has fleeting memories of a strange colorless room and being shown great vast areas of stars. His biggest memory is of fear . Terror like no other he has ever known is what Brain described during all of his strange encounters. Brain has suffered devastating illness early in his life. His doctors told him he has the insides of a 70 year old while still being a young man. He suffers enormous intestinal and stomach problems and easily becomes ill if spends too much time in public places. Light is now an issue for him and he spends a great deal of time protecting his eyes and skin when outside. He was not like this before but finds it the way of life now in his 40's. Brian is very bright and taught himself how to build and fix computers which is not an easy self taught subject. He is very creative and artistic all of which simply developed without the benefit of school or instruction. I found this man to be very similar to other abductees I have interviewed. His circumstances are a bit off the typical report but the overall scenario of his life fits in with most of the other people who suffer from lost time strange events . Brain like many other abductees is not sure who or what has been interfering in and altering his life. He knows his life events have been out of the ordinary however not sure if they were by way of the hands of aliens alone or a combination of a section of advance humans working with other species from other places. He is not sure if the beings or creatures he has encountered are a life form or if they are machines or part living part mechanical creatures sent to do the horrid deeds to the people who are taken and abused against their will. Brian did have one vivid recall moment of a creature that was very reptilian in appearance. He is not sure if the creature was in its natural state or if it was a being wearing some type of suit or protective skin . He does know it was horrifying. Like other abductee's Brain has seen strange crafts and lights during his life time that he could not explain or recognize. Like many others who deal with these events he knows the public does not believe him or want to hear about unknown experiences that do not fit in with the typical Hollywood version of Star War Movie . Brain long ago learned that the truth really is not sort out by his fellow humans as long as fantasy fills their needs. Brain has shared the story of his life with us in hopes it will bring added information to the list of those who continue to be taken and used before being discarded like a lab rat. It is time we opened our eyes and try to find the answers to all the strange and horrific encounters so many people are enduring. Like all abductees Brain hopes the paranormal will find a more serious road so people like him can live a kinder life . It is no fun being abused, used and thrown away to only have it done to you again by your own kind. I thank Brain for telling us some of what his life has been like and hope his words will one day help others who feel completely alone while enduring harsh ordeals at the hands of those abducting so many of us. It is very sad we take the view we do as people are taken against their will. Some people make it home. Others do not. We as a society simply do not seem to care. They Have the Whole Wide World in Their Hands! Who or What is Messing With Mother Nature?